at a time when the country is yet to recover from the impact of a drought and the consequent problem of hunger, the Union government has proposed to revise the grain bank scheme. Ironically, what could have been an effective instrument to weed out starvation from India's most poverty stricken tribal areas, is being seen as just another attempt to repackage the failed pilot project. The earlier scheme was started by the Union ministry of tribal affairs (mta) in 1996-1997. Under the pilot project, till 2001 Rs 1024.38 lakh was released by the mta to the Tribal Cooperative Marketing Federation of India Limited (trifed), which markets minor forest produce to set up 1876 grain banks. The banks propose to ensure food security in the lean agricultural period (May-September). However, ministry sources say that only 534 banks have been set up till 2001. The new Rs 250-crore proposal seeks to include more villages, especially, those under the drought-prone area programme. Currently awaiting the approval of the expenditure finance commission and the Union cabinet's nod, the revised scheme will target 25,000 villages across the country. The finance commission, under the Union finance ministry, is the body which clears grants for projects in India. According to S Chatterjee, joint secretary in the mta, each village has been allocated Rs 1 lakh to set up grain banks under the plan. The government aims to initially provide 0.2 tonnes of grain per family to start the bank -- twice the quantity disbursed in the pilot project. The ministry will allocate money to trifed, which in turn will identify state agencies and hand over funds to them. These bodies will then procure grain from the local markets to create banks. While officials are upbeat about the scheme, experts working with tribals are less optimistic. They point out that the recent plan -- like the earlier one -- has all the ingredients to come a cropper. They point out that though the amount of foodgrains to be alloted to each bank has increased, the implementation of the scheme remains the same. While the programme mandates the use of traditional methods to create grain banks under the guidance of the tribal head, the implementation powers are vested in the block development officer. "This makes it no different from any other government initiative -- alienated from the people," says Devinder Sharma, a Delhi-based agriculture and food policy analyst. Abhijit Sen, chairperson of the committee which prepared the foodgrain policy, 2002 avers that such projects require the involvement of the local people. Experts point out that the traditional grain bank system was successful because local people played a key role in it. They cite the case of the 'Gola' system present even today in Bihar and Jharkhand. Under this each member of the community contributes a part of the harvest to the grain banks. When required, people can take loans from the banks. It is felt that the process of procurement and distribution too lacks a novel approach. " trifed purchasing foodgrains through the state agencies is no different from the revamped public distribution system, which failed in tribal areas," says Bharat Ramaswamy from the Indian Statistical Institute, New Delhi, a premier national research organisation. The part played by the federation has time and again been questioned. Though the ongoing pilot project is in its sixth year, it has had no visible impact. As against a grant of Rs 730 lakh received from the ministry, trifed had spent only Rs 417.49 lakh by 1999-2000 (see table: Tardy disbursal). 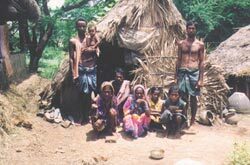 According to the 20 th report of the parliamentary committee on the welfare of scheduled castes and scheduled tribes, trifed's role in the utilisation of the funds is dubious. It observes that Rs 100 lakh was allocated to Orissa in the year 1999-2000, surpassing many other states with higher tribal population. It is ironical that even as an estimated 320 million people in India are facing starvation, close to 65 million tonnes of foodgrains are rotting in government godowns. And the latest attempt to revamp the grain bank scheme can be described as old wine in new bottle.